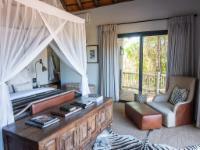 Jock Safari Lodge features two beautifully styled lodges - The Main Jock Lodge and Fitzpatrick's Lodge. Fitzpatrick's Lodge is the perfect haven for small groups, families, and individuals seeking to unwind amidst the natural beauty of the Kruger National Park offering three perfectly appointed rooms that cater for children. 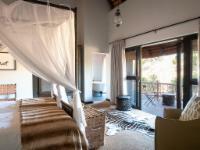 This new lodge can either be booked as a whole lodge with its own personal chef & game ranger or as individual suites. The lodge offers a lounge with TV and library, a second lounge with a fireplace, complimentary Wi-Fi, tea and coffee making facilities, perimeter electric fence and a rock swimming pool. The lodge is child-friendly, children aged 4 – 6 are taken on game drives in a closed vehicle whereas children from 7 to 11 join adults on the normal game drives conducted in open vehicles. Traversing through the concession, the wildlife is sometimes staggering in its diversity. Personally assigned rangers will delight in sharing their knowledge of this astounding natural treasure trove of the bushveld and slowly the mysteries of the wild will unfold. Enthralling sightings of elephants, prides of lions as well as a sea of buffalo horns rising from the grass as they lie resting in the growing heat, awaits one. Guests have the opportunity to learn about the history of Jock and the area with the cultural heritage of the bushveld. Safari: Morning and evening drives are performed in covered 4x4 Land Cruisers conducted by highly experienced rangers. Traversing through the reserve, the wildlife is sometimes staggering in its diversity. Spa: The Pilgrims Rest Retreat offers an escape to enjoy some pampering. Awaken your senses and allow us to rejuvenate body, mind and soul. All rates are quoted and invoiced in South African Rand (ZAR) on “per person per night” basis. Inclusive of VAT and Tourism levy. Excludes Kruger National Park entrance fee. We... All rates are quoted and invoiced in South African Rand (ZAR) on “per person per night” basis. Inclusive of VAT and Tourism levy. Excludes Kruger National Park entrance fee. We recommend a minimum stay of two nights throughout the year. A minimum 2-night stay restriction is applicable over the festive period during Peak season. considered adults and will therefore require their own room at the applicable rates. an adult is sharing a room with a child/ children. - Note that all rooms can sleep a maximum of two adults. excluded and can be settled upon departure). private deck and plunge pool. incurred per person as per our child policy. suite be occupied by less than four (4) persons. premium beverages are excluded and can be settled upon departure. A once-off fee is payable in cash upon entering the Kruger National Park. Please ensure you have your accommodation confirmation documentation at hand to ensure entry at the correct price. This fee is subject to change without prior notice and can therefore be obtained upon request from your Safari Expert. - This policy applies to all persons from 0 up to and including 11 years old. - Cots can accommodate a maximum of one child per cot. are accommodated at 25% of the adult sharing rate when sharing a room with adults – dependent on the availability of cots and/or additional bed. are accommodated at 50% of the adult sharing rate when sharing a room with adults – dependent on the availability of rooms with an additional bed. Applicable adult rate(s) will apply to children of all ages. The Jock Safari Lodge was a fantastic choice. The service was great, the atmosphere was exceptional and overall, it was just grand. Another point that needs to be looked at, is their internet connection, almost non existent. For business/emergency purposes, it is very important that be able to check email.Overall, everything was more than we expected and we would love to go back and take the kids. Jock Safari Lodge is 102.5km from the centre of Kruger National Park , the nearest airport 78.2km (Kruger Mpumalanga International Airport).